This week we are extremely fortunate to have Karol Kwiatek run a workshop for us in Ladybug techniques and embedded narratives and storytelling for heritage. Karol visits us from ICCI – Innovation for the Creative & Cultural Industries, University of Plymouth. storytelling is still a challenge. The workshop will provide a deeper understanding of three key issues: narrative, interactivity and 360-degree panoramic environments and also an expanded description of the term “interactive narrative” which is the basis for practical experiments with digital panoramas. Moreover, the concept of a convergence between a database and a narrative will be elucidated. Interactive storytelling has a chance to become a significant form of art in the 21st century, when this type of non-linear branching storytelling is merged with visualisations of locations using still and video panoramas. Still photography generates high resolution imagery through the use of a DSLR camera, a panoramic head and a fisheye lens, whereas video panorama (360-degree video) is produced by using a spherical video camera (e.g. Ladybug2 or Ladybug3). The workshop will focus on the integration of narratives with 360-degree imagery and video. A comparison is made to early film making, which instead of illustrating narratives, was concerned with demonstrating the latest achievements in camera developments. Moreover, different types of branching narratives will be presented in the form of story-graphs. The researcher’s methods of merging narratives with panoramas will be discussed. These are the concepts of a story-based panoramic interactive narrative, a map-based panoramic interactive narrative and 360-degree stories. The first idea uses the narrative as such to provide a user or an audience with two choices about how the panoramic non-linear story will develop. The second idea uses a map that extends a number of options at every road crossing point. By this method the process of building a branching narrative based on decision points (still panoramas) and narrative journeys (video panoramas) provide a potential to explore exhibitions in museums or cultural heritage sites. 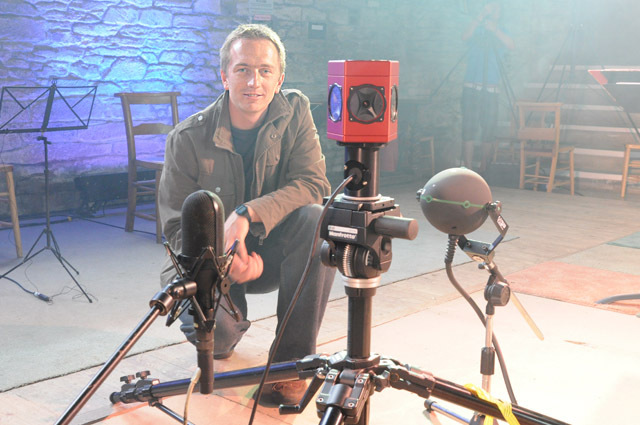 360-degree stories – the third method of merging narratives with 360-degree works – is evident when a voice-over is linked with 360-degree video. The workshop will start from the history of cinematographic cylindrical spaces. Then, it will explain why modern digital 360-degree screens are the basis for extending the methods of storytelling by adding interactivity. This explanation will help the audience to choose the right approach to further development of practical part of their studies and will focus on defining a story. The inclusion of storytelling with 360-degree imagery and 360-degree video appears to encourage and educate the audience when presented in a panoramic viewer, but the illusion of reality for narratives appears to work properly on 360-degree screens. The introduction to Lucid Viewer – software platform for developing immersion projects for the Internet and desktop – will close the workshop. Poland (2000-2005). I was also a Socrates/Erasmus exchange programme student at Dresden University of Technology (2004-2005) and the title of my thesis was: Generation of a virtual tour in the 3D space applying panoramas exercised on the sites of Dresden and Cracow, where methods of creating stereo panoramas were researched. This thesis was distinguished by Polish Ministry of Infrastructure in 2006. I am a panorama photographer and create multimedia presentations. I won a number of business awards at the University of Plymouth. My sole-trader was awarded the Microentrepreneur of Year 2006 in Poland. I published a few multimedia DVDs with interactive full screen panoramas and have designed the website about my research (www.charles3d.info and http://www.360stories.net). I won Dragons’ Den at the VC’s Research and Enterprise Conference 2009 and funds received allowed me to explore 360-degree opportunities in Canada. My paper presented on the Virtual Systems and MultiMedia conference (VSMM2009) was awarded the Best Student Paper Award. I am also a shortlisted finalist – Postgraduate Research Student of the Year 2010.
and the Electronic Visualisation and the Arts Conference, London, 2010, and will be presenting at the VSMM2010, Seoul, South Korea.